Creepy Cherub Distribution would like to bring some fun low budget movies to your theater! We are proud to announce the Blood, Fangs & Claws Film Fest Collection. Creepy Cherub Distribution represents several low budget filmmakers across the country, most being from the Albany, NY area of Upstate NY. 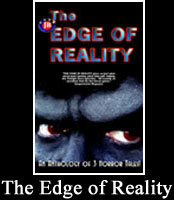 Trailers of the available films can be viewed on this page. Should you wish to have any of our movies screened at your theater please click the ADD TO CART button to purchase the rights to show them. Once purchased, a DVD copy or a downloadable digital copy in the form of a web address will be sent to you. There are no hidden fees and no percentage cut of the ticket sales. Just a non-refundable flat fee. Your theater keeps ALL OF ITS TICKET SALES! Not only will your patrons be supporting your independent theater, they will also be supporting independent filmmakers. These filmmakers have been supporting their own local indie theaters through the premieres of these movies. Perfect for late night midnight showings or weekend screenings in October or any other time of the year! Select as many films as you want. Using PayPal (which also securely accepts credit cards), purchase either a DVD copy of the movies, which will be mailed to the address you will provide. You can also choose the downloadable version of the movie where a link will be emailed to you. Your theater will retain the rights to show the movies you select as many times as you want for one month. If you wish to renew the license just come back at any time and make another purchase. When Dr. Nannoc's assistant transports a dangerous new creature to a scientific facility for disposal, the creature escapes and begins a rampage of DEATH! CRYPTID Theatrical Trailer from Archangel Productions on Vimeo. BLOODLUST is the story of young Maria Hunter who witnesses her parents being slaughtered by a vampire in their blood-spattered home. Hunter and her infant brother are adopted by the Church and grow up in a warm and loving environment until one night when the vampire who murdered her parents savagely kills her brother. The enraged Hunter leaves the secure confines of the Church on a crusade for vengeance on the creatures responsible for stealing her family from her. 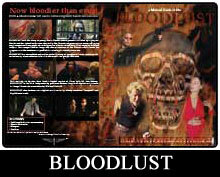 Bloodlust Teaser Trailer C from Archangel Productions on Vimeo. Scream Farm Trailer from Archangel Productions on Vimeo. THE DEEPENING - TRAILER from Archangel Productions on Vimeo. The Temptress Trailer from Archangel Productions on Vimeo. Shadow Tracker: Vampire Hunter trailer from Archangel Productions on Vimeo. OneLastKill-TRAILER from Archangel Productions on Vimeo. Dead Man: A tell-tale heart type story about a game warden who just won't stay dead! The Maze: About a man who comes face to face with his own worst enemy - himself! The Quarry: A modern Bigfoot story. 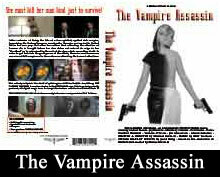 Vampire Assassin Trailer from Archangel Productions on Vimeo. A lighthearted dramatic comedy. Claire (Heather Blossom Brown) is a college girl who yearns to become an actress. She and her best friend Rebecca (Marie DeLorenzo) get involved in a crazy situation, hoping to make this dream a reality. Also stars James Carolus as Jeffrey Williams, the famous director Claire goes to great lengths to meet. Of Theatre & Bikinis Trailer from Archangel Productions on Vimeo.